Many animals endemic to islands have gone the proverbial “way of the dodo,” including, well, the dodo. Island species face some of the toughest climate and human-induced challenges, and some of them just don’t make it out alive. 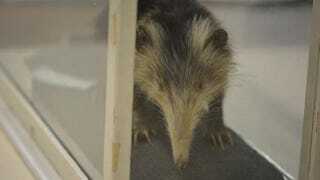 But new research shows how one strange creature—the Solenodon—was able to escape extinction by being hungry. From the outset, solenodons have some strange things going on: though they are mammals, their saliva is venomous, and they use their teeth to inject prey with it. They’ve been called “slow” and “clumsy” and have a strange gait that makes them move in a zig-zag. Solenodons look like what you’d expect if you asked a person on PCP to draw ant anteater. Or Mickey Mouse. But strange as they may be, solenodons’ most useful quality is that they are not picky eaters. New research presented at the Society of Vertebrate Paleontology conference in Alberta, Canada this week suggests that their ability to eat pretty much anything has helped them survive waves of indigenous and European populations in the Caribbean. By using a genetic technique called “metabarcoding,” Mychajliw was able to construct a detailed profile of the diet of modern solenodons from their feces. She concluded that the solenodon is a “flexible generalist,” meaning it can pretty much eat anything. If certain species that the solenodons ate died out, it could simply choose to eat others. This incessant hunger probably helped it survive for thousands of years. Of course, there are some caveats. For one thing, this is unpublished work that makes a hypothesis about the fossil record based on an analysis of modern genetics. We’ve reached out to Mychajliw for information on where her work might be published, in addition to any follow-up plans. Hopefully, Caribbean conservation groups will study the solenodon’s many oddities in greater detail. Their wholesome goodness is an inspiration to uncoordinated, hungry people everywhere.